Bob has been practicing law for over 30 years in the areas of corporate law, corporate finance, aviation, equipment leasing, mergers and acquisitions, corporate governance and succession planning. 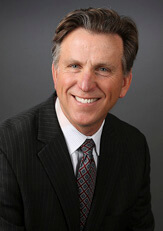 Prior to founding Fafinski Mark & Johnson, he served as chair of the Business Law Department and on the management committee of one of Minnesota’s largest law firms. He has consistently been honored by peers as a “Super Lawyer” since 1998 – an honor given to only the top lawyers in Minnesota. His peers have also named him a “Leading American Attorney”; he has been named one of the top 25 business lawyers in the state and he has been designated one of the world’s leading commercial aviation attorneys by a respected international aviation journal. In 2014, Bob received the Small Business Person of the Year award from the Eden Prairie Chamber of Commerce. He has been named to the “Who’s Who Legal: Transport” list for Aviation Finance in 2017 and 2018. Former Executive Board Member for Common Hope, a Minnesota based non-profit which works in 27 communities helping more than 14,000 impoverished children and adults create a better life for themselves. The program focuses on education, healthcare, housing, and family development in Antigua, New Hope, and San Rafael, Guatemala. Chair of capital campaign that raised $2,400,000 for Guatemlaen families to educate their children. Member of the Board of Governors of the University of St. Thomas Law School from 2012 – present. Member of the Executive Committee of the Board of Governors from 2016 – present. Bob and his wife Mary have had five children. Their oldest son Rob spent four years in the Marine Corps and served two tours in Afghanistan as an infantry platoon commander. Rob recently joined FMJ as an associate. Their son Jack died of SIDS at the age of two months. Katie is working as a nanny. Joe works at a local direct mail company and Booey is finishing up at Arizona State, getting ready to join the business world in a sales position. Bob has always been a die-hard Bruce Springsteen fan but recently, at the urging of his kids, has discovered country music and now lists George Strait, Toby Keith and Alan Jackson among his favorites. His “discovery” of country music explains the recent purchase of a black Chevy pick-up truck. Bob is also a fan of all Minnesota sports teams especially the Minnesota Twins. He has also been a Chicago Cubs fan since he was seven years old and suffered through many years of “wait until next year.” Now that the Cubs won the 2016 World Series, “next year” has arrived!